Can Thoughtful, Good-hearted People Disagree on Mormonism and its History? Earlier this year, I was lucky to help launch Village Square, Salt Lake City (see VillageSquareUtah.org) – a local chapter of a national organization dedicated to raising the quality of conversation across our country’s deepest divides. Climate change, Gay marriage, Religious Freedom, Policing, Immigration? We’re on it! A core assumption of the Village Square is that thoughtful, good-hearted people can disagree on just about anything. I’ve been thinking about that question – exploring it with Dr. Mark Foster and a few other friends at varying places in relation to the (LDS) Church. Maybe this is why one thing both active and former Mormons can agree on is how absolutely ridiculous the back and forth between us ends up being. Ever since beginning this extended conversation with Mark and a few others, I’ve been repeatedly blown away at (a) how enjoyable it is to talk deeply and seriously across these differences and (b) how painful it is to witness the crazy levels of angst and hurt that has become a permanent fixture in many mixed-Mormon-orientation families. Could there be more to learn about each other? (Or like most family feuds, will we insist on knowing each other with such utter certainty as to make any sort of wondering or new insights wholly impossible?) For me, at least, talking has taught me a lot – especially how misunderstood many former Mormons often feel (by active members)- and how paralysis and alienation can continue for years as a relationship residue after someone steps away from the Church. Can we do better than this? Or is this ‘just how things have to be’? Yes! (to the first) And no way! (to the second). There is simply too much goodness (on both sides) of this conversation – and way too many reasons to work towards improved relationships. For the sake of US (the Mormon-linked Diaspora), Mark, (Shelby, Brian, Lisa, Anna, Tom) and I all agree that we’ve got to figure out a better way to navigate this conversation. In both cases, the response in the class was the same: silence. How else do you respond to something like that? After all, any level of disagreement voiced is sure to be awarded with some kind of new label – “irrational” or “anti-science” or “anti-God” or “demonic”…or any number of other pejoratives. (1) Religious power-plays. This is an important place to start – and one I would not have likely included before my time with Mark. By being exposed to more stories, I have become more acutely aware of how much our Mormon community’s invocations of divine authority and emphasis on eternal consequences can, at times, be experienced as heavy and even aggressive – especially to those who have stepped away from the faith. Often, these individuals sincerely desire ongoing relationships with active Mormon family members and friends – with naturally leads to members doing what members (sometimes) do: extending invitations to return. It’s during these invitations (or after they are declined) that pressure can sometimes be ‘ramped up’ by references to the afterlife and priesthood authority. Bottom line: Let’s acknowledge space for disagreement and different interpretations when it comes to religious teaching. No scriptural text evinces a reality so ‘obvious’ that everyone-who-is-reasonable-must accept one interpretation. Rather than weaponizing doctrine to ‘put someone in place,’ let’s insist on drawing upon it more tenderly and appropriately in conversation between us (Mormon/Former Mormon). Even though the full scope of research on every one of these questions is nuanced and complex – involving competing interpretations from different researchers – this is rarely what we hear. Maybe you’re even having a reaction right now by the notion that research around any of those issues list above is “nuanced”: What? No way! THAT is settled and beyond dispute! And that is precisely why we need to talk about The Scientific Power Play. Left out of these grandiose pronouncements is the reality that virtually all philosophers of science accept and admit: data does not and cannot ‘speak for itself.’ The process of generating and documenting data is extraordinarily complex, multi-faceted and human. Just as data is generated by multiple human decisions, it must be interpreted by this same human judgment – aided, but not replaced, by various methodologies. Pretty understandable, right? Hey – if you have a chance to say “reality is on my side” (and to have lots of people believe it), who would want to give up that power? Bottom line: Let’s acknowledge space for disagreement and different interpretations when it comes to scientific findings. Like religious text, no data conveys a reality so ‘obvious’ that everyone-who-is-reasonable-must accept one interpretation. Rather than weaponizing this data to ‘put someone in place’ – let’s insist on using it more thoughtfully and appropriately in conversation between us. (3) Historical power plays. Interestingly enough, this same pattern shows up in a third area – historical evidence. Like in the scientific world, it used to be common for historians to claim their methodologies permitted an authoritative “window into the reality” of what happened. In the modern day, historians simply don’t believe that anymore. Instead, there is an acknowledgment that historical evidence is similarly embedded within inescapable cultural narratives and interpretive standpoints. To presume to escape these for some neutral view-from-nowhere is pretty much no longer believed to be possible among philosophers of history (or science). But in the general public, we love to still make these claims, don’t we? “The historical evidence says X”! Claims made by both Mormons and former-Mormons often sound this way. On one hand: “If you really study the translation process of the Book of Mormon, you would realize there is no other way it could have happened other than God!” is a refrain common among Mormons. By portraying historical details as so obvious that they ‘speak for themselves,’ clearly this had a certain kind of impact on this man’s spouse. Never mind the vivid contrast in available interpretation surrounding Joseph Smith’s history – this man’s conclusion is presented (and likely received) as unquestionable and uncontested. And that’s precisely where the ‘power’ comes from. In place of a thoughtful conversation about contrasting interpretations of nuanced evidence – we pull out the “nuclear option” and put someone in their place. Nowhere is this more clear than the impact of commentary about Joseph Smith’s own personal life. There you have it: What more needs to be said? A lot more! We have people still debating the 2014 Michael Brown death after 150 pages of testimony, and you want to claim the case is closed on sketchy details about incidents we’re 150 years removed from?! As respected historians like Bushman have pointed out, the context around Joseph’s wives clearly supports more than one legitimate, thoughtful interpretation – including one that does not so quickly assume sexual deviance. For instance, “sealing” at the time was understood to be a loose way to spiritually unite the early Church community – with no evidence that many of the unions were ever consummated. All context and diversity of historical interpretation are ignored, however, when a power play is made (on either side). Even without realizing it, we paint a historical picture in which only one interpretation can be legitimate. When it comes to how we frame Mormon history, the consequences for people’s lives and faith and families are real. If someone wanted to launch a concerted assault on the core of Mormonism, can you think of a better pressure point? 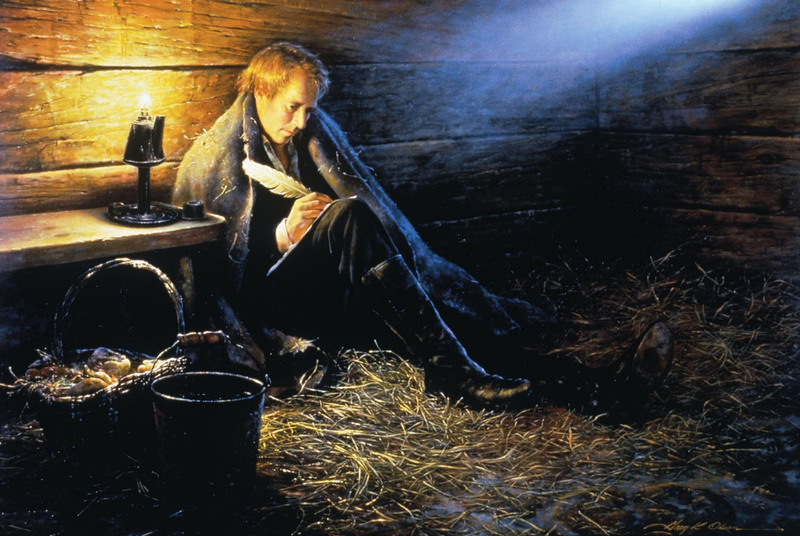 One hundred and seventy one years after the Prophet Joseph Smith was assassinated, he is undergoing a forceful, second kind of (character) assassination – as strident accusations are made on his integrity and purity. Know that I (like many of your member friends) will love and respect you no matter what. To otherwise pretend that historical (or scientific) evidence justifies only one interpretation is to leave no space for others to stand. Not only is this approach dismissive of other thoughtful interpretations of the historical evidence, it seems to completely ignore the interpretive nature of history itself. Please don’t misunderstand: It’s okay to speak with conviction and passion about what you believe; it’s also okay to be an advocate (or missionary). What’s not okay is to do so in a way that shatters people’s faith by leading them to believe there is only one sensible, legitimate, thoughtful interpretation of X question. In other words, it’s okay if you believe that the Prophet was sexually deviant. What’s not okay is pretending (and getting others to think) that history only justifies this single interpretation of his intimate life. Even Jesus Christ himself was interpreted in very different ways by the people of his day. While one group proclaimed him as “Christ, the Son of the Living God” – another group insisted, “This fellow doth not cast out devils, but by Beelzebub the prince of the devils” Matthew 12:24. To summarize: Nothing in history is so clear that it cannot be interpreted in different ways. Every issue raised in the Letter to a CES Director and every question posed by Dehlin’s Mormon Stories podcasts – every one of them, involves events understood and explained in very different ways by thoughtful people. Likewise, every question explored on FAIR and FARMS – every one of them, involves issues that reflect diverging interpretations from thoughtful people! Bottom line: Let’s acknowledge space for disagreement and different interpretations when it comes to historical findings. Like religious text and scientific data, no historical evidence conveys a reality so ‘obvious’ that everyone-who-is-reasonable-must accept one interpretation. Rather than weaponizing this evidence to ‘put someone in place’ – let’s insist on drawing upon it thoughtfully and appropriately in conversation between us. Towards a More Thoughtful Conversation about Mormonism and its History. Want to hear the BEST thing about welcoming the inescapable role of interpretation? Rather than posturing to see who can sound most convincing, this opens up a new possibility: actually getting curious about our different interpretations. Indeed, this core insight about the self-interpreting nature of (all) human beings opens up a new space where we might gather. A place of more uncertainty. More humility. And more radical acceptance and openness. So there you have it: Rather than indulging subtle aggression in trying to presume that all the data or history or scriptures support only one view (our view) – how about opening the conversation to the (interesting) differences in how to interpret X or Y? From the Mountains Meadows Massacre to Joseph Smith’s wives, why not make space for thoughtful differences – and allow them a fair, open hearing? Hmmm…doesn’t quite have a great ring to it, right? Maybe it’s time to learn from those who are doing this conversation right. This fall, Village Square Utah hosted a forum bringing together a group of local Utah residents with a combined 132 years of experience in bridge-building, dialogic, rich conversation across the “religious divide” in Utah. We’re also preparing a new series of documents – “Ten Ways that Thoughtful, Good Hearted People Disagree about X.” Each is prepared collaboratively drawing on the input and insight from diverse perspectives. Stay tuned for our Mormon History edition! Thanks for listening. This was a dousey. You totally deserve a gold star. Share your thoughts below! I’m really not that important…which means I actually read and try to respond to them all (eventually…). [Longish footnote warning! Too interesting too leave out…too peripheral to leave in the essay]. The inescapability of interpretation. We tend to see thoughts in western culture as a reflection of reality or selfhood. If we think something – then we take for granted it must say something about our life! One of the early discoveries of those starting mindfulness practice is that their thoughts are not the same thing as “reality.” In other words, from a contemplative perspective, thoughts may simply be…thoughts! The same thing could be said about our interpretations about anything. For instance, we tend to see particular interpretations of the world as “reality” – vested with religious or scientific authority. Indeed, it’s common to hear a particular piece of (scientific or historical) evidence presented as somehow ‘speaking for itself’ – whether that be a primary source document, a rock, a micro-organism, etc. All these things are considered as something we’re able to see and know face-value, straight-up and independent of any human judgments – in a kind of purely objective realm divorced of values, judgments and interpretations. This notion goes back to Descartes’ own argument dividing the world into “subjective” and “objective” realities – with the subjective realm a place of messy human values, beliefs and feelings and the objective realm presumably separable and independent – containing hard, concrete realities of life. Surely the best thing about Descartes’ subject/object construction was how it super-charged interest in the scientific method as a way to attempt access to the “objective” world – while controlling and keeping at bay the subjective. There is no question that this uniquely rigorous attempt to explore the world has helped generate innumerable insights into the nature of reality. Nearly 100 years ago, however, philosophers starting with Martin Heidegger, Hans-Georg Gadamer and Charles Taylor began to raise a nagging question about the enlightenment era philosophy taken for granted for centuries: On what basis do we truncate ‘reality’ into two separable domains of subjective and objective – might this be a seemingly arbitrary and misguiding distinction? From that very question, modern philosophy reached a turning point and began moving in an entirely new direction. Rather than continuing a project of trying to access a reality somehow outside or independent of our own interpretations, philosophy began to acknowledge that a central part of reality itself is our nature as self-interpreting creatures. In other words, interpretation and judgment were inescapable – and could not somehow be cleanly “put on the shelf.” Rather than pretending to stand in a purely neutral stance or claiming a “view from nowhere” – scholars began acknowledging and exploring their own standpoints. The resulting scholarship and discovery has been breath-taking to behold in many realms. Rather than trying to craft the “one true history” of this or that, historians began to paint more nuanced pictures that acknowledged paradoxical evidence and uncertainties that allowed contrasting interpretations. Hard scientists came to accept that measurement and assessment inherently reflected interpretive biases – and the very act of measuring something changed the thing you were trying to measure (see Heisenberg’s Uncertainty Principle). In the social sciences, researchers began to experiment with methods that acknowledged the messy interpretive nature of human beings – (see this critical historiography of PTSD written by two colleagues). [This corresponds with a core insight in mindful practice – namely, the holding in awareness the various thoughts and interpretations one might hold about a given situation]. What would it mean to take this philosophical shift seriously in discussions of Mormon history? How might it change our experience of history – and the clash over its meaning? I personally believe this shift could change absolutely everything…especially when it comes to interactions between Mormons and former Mormons. The scientific task of giving experience closer attention is of great value – no question. No matter how many methods, no matter how many controls, and techniques employed to subdue “subjectivity,” however, interpretation simply cannot be escaped. This is NOT the same thing as denying objective truth – or suggesting that everything is just “constructed in our minds” – e.g., “you have your truth and I have mind” relativism. Instead, this (philosophical hermeneutic) perspective argues that all experience is partially constituted by our interpretations – in an ongoing, moment by moment interaction with very much a “real world” – resulting in experience that is constantly and inescapably mediated by human interpretation. If that’s true, then maybe we should pay more attention to it? I do believe many people sincerely believe the science only justifies their interpretation…In other cases, it seems clear that people who know about the complexity choose to frame it differently for the effect that might have on people. Yes, he’s a Mormon, but a respected, award-winning Columbia professor Mormon at that! Hermeneutics, Not Relativism. it’s important to point out that denying the subject/object divide is not the same thing as denying the existence of truth. It’s simply pointing out that finding truth is not quite so simple and easy as we sometimes make it out to be in all our talk of scientific or religious methodologies. From this perspective, then, there is an actual truth to be known, but it may not be as simple as you think to discover it – or as obvious as you think to all “logical” people. In turn, we might need more humility in the process of doing so – and sharing what we see. As reflected here, after dividing the world into “subjective” stuff and “objective” stuff – it’s easy enough to pin our hopes on all things “objective” – and to lump everything else (values, morals, spiritual stuff) in that fuzzy, unreliable, “non-verifiable” realm. 10 ways that thoughtful, good-hearted people disagree about Mormon history. 10 ways that thoughtful, good-hearted people disagree about the Mormon experience. 10 ways that thoughtful, good-hearted people disagree about the experience of walking away from Mormonism. Any takers? E-mail me at jzhess@gmail.com to join the creation team…You will be recognized when we eventually release them. « The Good News of THIS Moment?